Louis stood patiently outside the parole board offices after the hearing as people lined up to pat him on the head. He nuzzled up to many of his admirers, giving some a big, juicy lick on the face. 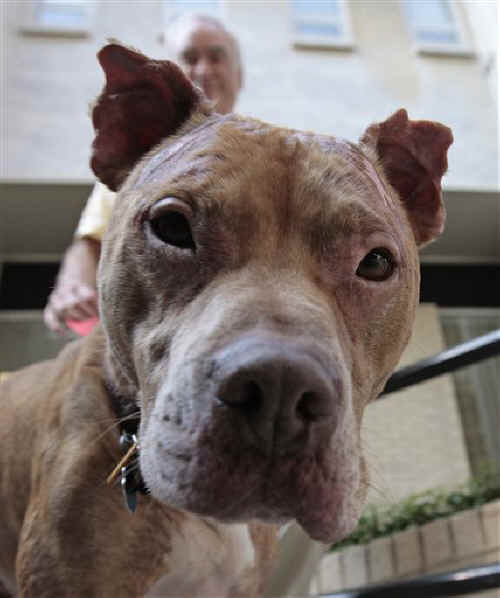 A scarred but friendly pit bull named "Louis Vuitton" was the star witness today as an Alabama state board denied parole for the man convicted of spraying him with lighter fluid, setting him on fire and beating him with a shovel. After the 8-year-old dog was led into the packed hearing room, the Alabama Board of Pardons and Paroles voted 3-0 to deny early release to 23-year-old Juan Daniels of Montgomery, who was sentenced in 2009 to nine years and six months in prison, a record in Alabama in an animal cruelty case. Daniels, whose supporters said he had been sentenced far more harshly than criminals who harm human beings, will be eligible for parole again in July 2012. The dog stuck his head forward for everyone who wanted to pet him as he entered. He bears burn scars from his head to his wagging tail, including white lines on his brown body where the burning lighter fluid seared his skin. 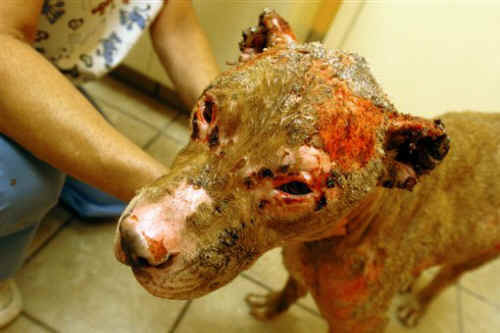 "You have to see the scars to see what was done to him," said the dog's owner, Dee Hartley of Montgomery. She and her husband adopted the dog after the torture incident. It's unusual for a dog or other animal to make an appearance before such a panel. "I don't recall every having one here before," said Cynthia Dillard, executive director of the Alabama Board of Pardons and Paroles. The September 2007 attack on the dog drew wide notice. The Montgomery Humane Society got as many as 50 calls a day about the case, some from other countries. The dog was given the name of a French fashion brand, "Louis Vuitton," in honor of a dog named "Gucci," whose torture case in Mobile in 1994 led to passage of "Gucci's law," which made animal cruelty a felony in Alabama. More than 60 law enforcement officers, animal rights advocates and other supporters of Louis crowded into the hearing. Relatives and friends of Daniels also faced the board and asked that he be released. Montgomery County District Attorney Ellen Brooks asked parole board members to make Daniels serve his entire sentence because of his cruelty to the dog and the nine disciplinary actions taken against him in prison. "The first reason to deny parole is to prevent him from hurting another animal or a person," Brooks said. She said he was accused of torturing the dog, which then belonged to his mother, because he was angry at her for not letting him use the car. His mother, Vellica Daniels, asked for leniency for her son, so that he could get on with his life. A cousin, Thomas Hudson, said after the hearing he didn't think it was fair because Daniels is behind bars with "folks who committed more extensive crimes than he committed." Holladay Simmons, the veterinarian who treated Louis immediately after he was burned, told the board the dog's wounds were as bad as she had ever seen. Matt Cooper, the county animal cruelty officer who responded to the call, said after the hearing, "I've worked cases where people let their dog starve to death, but this was the worst case of animal cruelty that I've seen."